Pretty old anime (at least I thought so, when I saw drawing, which wasn’t very nice to the eye, though it was still fun to watch). It is a story about a girl and two her lovers. She starts to go out with one then jumps on other (for some understandable reasons, but still lets not forget the fact). And basically that’s the idea of all anime. Jumping from one to other. Also there is a “friend” of the Momo-Chan, who in all the ways tries to mess around the pour girl and make the story have at lest some seance. When I started this anime I thought I was watching some soup opera, because its like in those movies for teen girls about true love, romance and brave boys who will help a girl even if she’s with somebody else.. ya sure.. 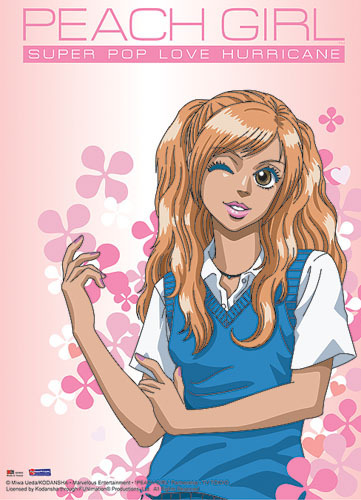 The name peach girl comes from dark skin of Momo-chan. That’s also important (thought only in the beginning) because she is told that Toji (Lover No.1) doesn’t like dark skinned girls, but she already is tanned because of the swimming all the summer. But eventually she gets with him a chance ^.^ ohh that would have been such a nice ending if Sae hadn’t put her hand on it and made Toji get together with her… Then there’s also Okayasu (Lover No.2) who is “so in love” with Momo-chan and bought her heart with all that kindness and nice little things. But of course how could it be ok if there’s still 10 or more eps ahead >.> and things go around when it appears that Okayasu is really in love with totally different woman. So what else could Momo-chan do if not to try to get his heart the same as he got hers. As No.2 goes on a trip to understand his own feelings Momo-chan stays and there appears… yes you guested it Lover No.1. As Sae releases him from her hands, he starts to get back his old beloved one. And right there this anime just lost me. Both of the boys are just impressively good and try to help for poor girl. You know.. the type that only exist in fairytale and young girl’s dreams. In the end they put her in the position that she has to decide who she truly loves. Hard situation isn’t it? This entry was posted in Anime and tagged Hiroshi Ishiodori, Miwa Ueda, Peach Girl, Studio Comet. Bookmark the permalink.